It has been said, that people have been visting and searching for Cape May Diamonds since the early 1800's. However, these diamonds are actually quartz crystals that wash ashore as smooth rocks, so they are not real diamonds. They are pretty though, and do resemble actual diamonds once polished. The best beach to locate these diamonds is Sunset Beach in Cape May Point, NJ. Sunset beach is located on the Delaware Bay. These rocks start in the upper Delaware River and wash down river, brushing against rocks along the way, to create the smooth looking stone. It’s actually pretty cool when you think about it, some rock starts floating down the Delaware River for years upon years, brushing against rocks all along the way to smooth it out, and comes to rest at various places including at Sunset Beach. When you stand on Sunset Beach, you’ll see a hunk of concrete sticking up out of the water. This is an old concrete ship that was intially going to be sunk to create a type of breakwater. However, before this concrete ship could intentially be sunk, while it was awaiting its fate and sitting in the water, a heavy storm approached and ripped the ship from where it was docked. The ship eventually hit a sand bar and became stuck at its current loction. 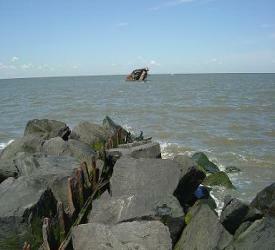 Some say that this sunken ship forces the ‘Cape May Diamonds’ to wash ashore at Sunset Beach. The best place is Sunset Beach. As you walk along this beach, you'll see that the sand is mostly made up of pebbles. It's actually not that pleasant to walk on. But, your diamonds will be amongst these pebbles. Grab a bucket or just scoop a pile of sand with you hands, sift through it, and you are looking for clear looking quartz like stones. If you keep looking, you'll be able to find some. And if you find one you like, keep it. 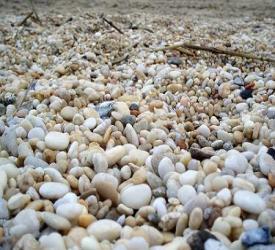 There is no cost to take these stones home since you found them yourself on the beach. If you ever want to make the stone into jewelry or some other type of decoration, you will mostly likely be able to take the stone to your local jeweler and they should be able to polish it and hopefully put some facets on it for you. There is no great value in these stones, I’m not sure how many people outside of this region have even heard of ‘Cape May Diamonds’, but they say they are known worldwide. They are nice to keep as memories of Cape May and Sunset Beach. So, where to buy Cape May diamonds? They can be purchased as polished stones in many little shops throughout Cape May NJ. There are even some gift shops at Sunset Beach that sell these polished stones in various ways. The various ways include most jewelry including rings, earrings, necklaces, etc. And also you can find them as souvenirs in jars, picture frames, etc. The Delaware River is where the Cape May diamonds supposedly come from. This river starts in Catskill Mountains in southeasterly New York and flows all the way down to the tip of New Jersey's penisula. This is essentially the route for the Cape May diamond. 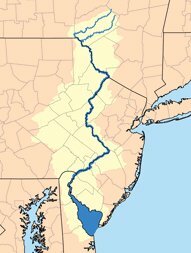 The River creates a natural boundary along the northeasterly portion of Pennsylvania and the southerly portion of New York and the entire border between New Jersey and Pennsylvania. The total length is approximately 410 miles. It is reportedly the longest undammed river east of the Mississippi River. It supplies nearly 5% of the United States with drinking water. If you look at the map to the right, you can see the flow of the Delaware River. Take a look at Cape May. It is located in a perfect spot to ‘catch’ these diamonds. Sunset Beach is located just on the westerly side of the tip of that peninsula.